Santa Fe’s Railyard is now home to more than trains. It is fast becoming a vibrant eclectic area filled with art, dining, entertainment, and recreation. The Railyard is another central Santa Fe destination. Not far from the Plaza and Canyon Road, the Railyard has always been a multi-purpose site. In 1880 the first train came into Santa Fe. The Atchison, Topeka and Santa Fe Railway Company made its journey to Santa Fe on a spur line, built because mountain ranges prevented Santa Fe from being on the main line. With the train, came tourists. The Railyard soon developed into a social center. 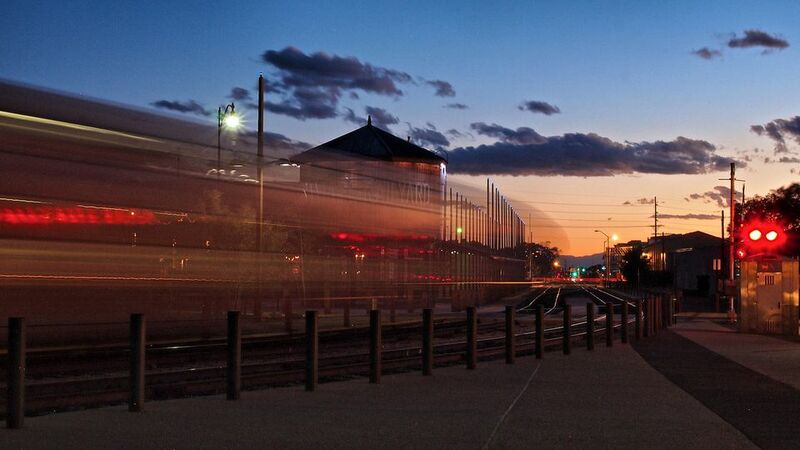 The Railyard Corporation website paints a picture of a gathering place for locals. “By the 1940s the Santa Fe Railyard was an active center for the locals in Santa Fe. Neighbors, still living next to the Railyard today, remember those afternoons picking wild lettuce and swimming along the acequia. In 2002, building on this history of a social center and gathering place, the Railyard Master Plan was approved by the City of Santa Fe. The Master Plan honors the history and cultural heritage of the site and encourages the presence of local businesses, particularly non-profits, with a focus on arts, culture, and community. The Railyard already is moving forward with the presence of the ​Santa Fe Farmers Market, ​SITE Santa Fe, Warehouse 21 and El Museo Cultural. A great way to see the Railyard is to start at the Santa Fe Train Depot area and have lunch at Tomasita’s. Not ready for lunch yet? Start at Site Santa Fe, a contemporary art space with stimulating exhibitions. Santa Fe Southern Railway, “The Train,” offers year-round excursions departing from the historic mission-style depot in the Railyard. Day trains, cocktail trains, and BBQ trains make up the regular schedule. Also available are group rates, charter options for personal or corporate events, and a full complement of holiday and special trains, including 4th of July fireworks train and Christmas trains. The vintage coaches were recently painted and “The Train” has a bright new look. ​More Information. Tomasita’s, a long-time Santa Fe tradition, is located adjacent to the Railway depot. It is a vibrant, noisy restaurant with great margaritas and typical New Mexican-Mexican food. It’s a fun place. SITE Santa Fe is a contemporary art space with time-limited exhibitions, lectures and events. When I was there SITE Santa Fe featured an exhibit on “Los Desaparecidos,” a social commentary on those who had disappeared in Latin America. Members of the resistance and their sympathizers who were kidnapped, tortured, and killed by the military, especially in the latter decades of the twentieth century were termed “Los Desaparecidos.” It is exhibits and discussions on social/political issues such as this that makes SITE Santa Fe, not just an art museum, but a center for education and community interaction. The Railyard is the new permanent home of the Santa Fe Farmer’s Market. The market that began with a handful of farmers in the late 1960s has grown to be one of the most widely recognized markets in the United States. Now with over 100 vendors, the market runs in all seasons. During the summer season enjoy fresh vegetables, flowers, honey, cheeses, eggs, meats, herbs, chiles, and crafts. Be sure and check the ​Market’s website for location and hours. These change seasonally. ​More Information. El Museo is a center for art exhibits, theatrical productions, art fairs, children’s programming and the Winter Contemporary Spanish Market. I attended a preview session for the Santa Fe Indian Market at El Museo. It is a large, rambling space in a former warehouse building. ​More Information. One of the fascinating galleries in the Railyard district that I visited was the TAI Gallery. I have never experienced such simple beauty. The primarily Japanese art focuses the eye on the beauty of textures and lines. Established in 1978, TAI Gallery is the leading purveyor in both the United States and Europe of Japanese bamboo art and museum-quality textiles from Japan, India, Africa and Indonesia. Watch for parks, bike and walking paths along the acequia and more interesting venues. The railyard is worth a visit. Wear walking shoes and visit both the Baca area and the North Railyard.